Lamiflex – offers packaging versatility. 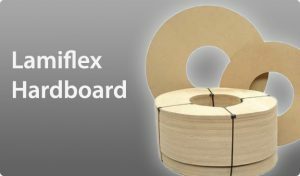 Lamiflex offers packaging grade hardboard versatility. Is light and easy to handle. Eliminates risk of injury because there are no sharp edges. Absorbs impact which results in good industrial protection. Insulates products thus reducing condensation and moisture build up. Is a wood based material which is reusable, easily disposable and recyclable. Hardboard donuts for steel coils and paper roll face protection: Thickness 3.2 mm – Diameter up to 2140 mm. Hardboard for bore and mantle protection for coils: Thickness 2.0 – 2.5 mm – material can be formed down to fit 400 mm bore diameter.